The Christmas season is set to get underway at Woodthorpe Park Plant Shop tomorrow (Saturday 24 November) with a programme of shopping and entertainment over each weekend until the middle of December. Situated just off the A60 with plenty of car parking, the plant shop offers great gardening gifts and general plant stock all year round and its nursery supplies gardens and councils all over the country. During the festive season, visitors can enjoy music performances and floristry demonstrations while being able to shop for great locally made gifts and local crafts from pottery to pickles. Visitors can also try amazing local food. The events will run between 10am and 5pm each weekend. Made even more seasonal with the smell of roasting chestnuts in the air, the site will become a little Christmas village with beautiful gifts and Christmas decorations for sale as well as face painting, trails, and tree decorating to keep the children entertained. There will be Christmas craft areas for demonstrating honesty bags, wreath making and quirky crafts with Curious (Sarah Manton – from the creative quarter) as well as family photo areas to grab a selfie on a sleigh and keep a souvenir of a great day. Tasty and fresh food will be available to buy including; chestnuts, mulled wine, locally roasted coffee, grilled cheese, roast potatoes, cakes, and a selection of vegan options. Live music will add to the Christmassy feel with performances from the University of Nottingham Choir, Oxton Hand Bell Ringers, Robin Hood Youth Theatre, Brass Bands and local choirs across the four weekends. Fresh Christmas trees will be on sale with over 800 to choose from. The traditional Nordmann Fir is in stock as well as a new tree this year, popular in America. The Fraser Fir, deemed to be the ‘perfect’ shape; is highly scented, with low needle drop. It is the same species of tree welcomed to the White House by the Obama family when in residence. The trees are all British grown. Prices remain the same as last year and the year before that and start at £20.00. They are available as cut trees or with roots in a pot. Those more green-fingered will welcome the chance to pick up home grown poinsettias and cyclamens. 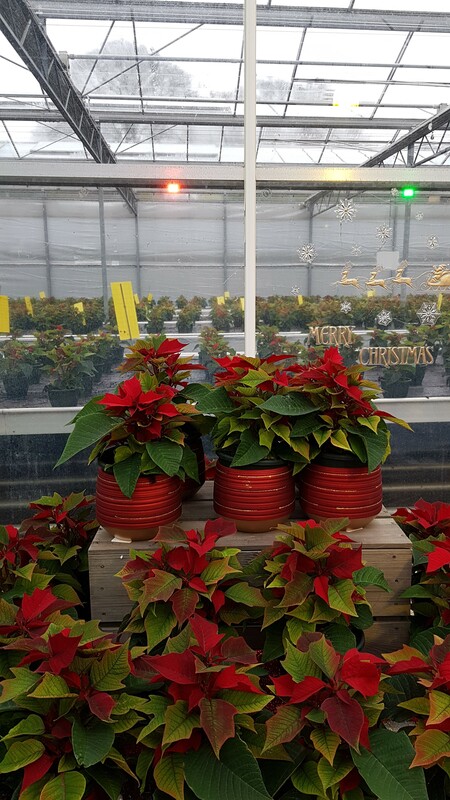 1000 poinsettias and 1500 cyclamens have been growing at the nurseries on site since the summer where Christmas comes very early indeed for staff.